The Acoustic Revive RR-888 is Ken Ishiguro’s third iteration of a diminutive, stand-alone device that, from the start, made obvious contributions to the quality of recorded sound. No larger than a small box of chocolates, weighing next to nothing, my original RR-77 sat, as recommended, well above and away from the audio rig where the RR-777 and RR-888 likewise sat and sit. I would never dissuade a sound buff from springing for as much IPC hardware as he can afford, emphasis on afford: all told, a not negligible money mound. Best to mention that, apart from my RRs, the IPC array is all that I know about this exotic aspect of audio enhancement. Which brings us to “Seriously? !” I propose to compare the RR-888 to my IPC pieces. Agreed, a comparison of a small, relatively inexpensive box against a costly array is the equal in absurdity to an MMA bout between a florist and gorilla. Except that, having made comparisons, I can assure you that the contest is far from absurd. The RR-888, very long in development, is a potent step up from its predecessors. Even in this lopsided arena, it acquits itself admirably. Eyes, however, preceded ears. I set up the 888 in the TV room where we’d been using a 77 for an uptick in picture pizazz, especially noticeable with hi-rez broadcasts. Replacing it with the 888 produced yet better color saturation. In short, I’d recommend the 888 as an important addition to any home-theater setup. Further, I’d recommend a linear power supply. When I replaced the provided 12v DC wall wart with a NuForce Linear Power Supply the qualities I’ve described intensified to a degree. However, remaining with the wall wart isn’t the worst of choices. As this is a subjective report, I propose to wax fanciful. The remarkably effective RR-888 treats the room. It assists in creating a volume of air that better helps audio reach its potential. Absent the RR-888 or IPC array, the audio system, albeit good, is impeded. To say it again, the RR-888 creates – or, better, allows for – an enriched and expansive soundfield. With a number of my better-engineered recordings the speakers bear little perceived relationship to the sounds filling the room. At $685 USD, the RR-888 is something very like a must-have addition. Again, I started with the provided wall wart and liked what I heard. It might just be enough for you. However, substituting a linear power supply impresses me as an improvement, tho certainly not of the I-can-hear-the-difference-in-the-shower variety. 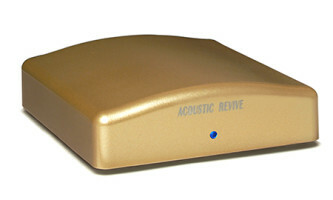 Note: Acoustic Revive warns against Internet counterfeits. The RR-888 must be purchased from an authorized dealer. The AR Web site lists worldwide distributors.